Talking about BJP's new initiative 'Bharat ke mann ki baat, Modi ke saath', Shah said that the exercise is aimed at democratising the process of preparing manifesto and that this 'unique experiment' will strengthen democracy. He also hailed Centre’s decision of filing petition in Supreme Court demanding return of excess land to owners.”Court ke andar lambi behas hai,phir bhi 1993 mein jo zameen ko adhigrahit kiya gaya, us bhoomi ko BJP sarkar ne Ram Janmabhoomi Nyas ko wapas dene ka faisla kiya hai. Ye ek historic kadam hai, aur main opposition parties se kehna chahta hu ki case mein roda na dalen. (This is a historic step by the government. I urge Opposition parties to not create any hurdle in the case),” said the BJP president. Addressing the event, Shah lambasted the previous UPA regime saying that the country had suffered because of their populist policies. “Before 2014, parties made false promises and did not do anything concrete, this led to all the economic downfall of the country. There was no financial stability. For 30 years, no concrete or visionary steps were taken to solve the problems of the country,” he said. He also showered praise on PM Narendra Modi stating that the NDA government has changed the country’s position in the last five years. His (PM Modi) visionary policies have laid the foundation for long-term development in the country. At present the world looks at India with respect,” Shah asserted. Furthermore, Shah claimed that there is a difference between BJP and the other parties. “The BJP is the only party which believes in internal democracy. The party which has internal democracy can only strengthen the democracy of the country,” he stated. Talking about BJP’s new initiative ‘Bharat ke mann ki baat, Modi ke saath’, Shah said that the exercise is aimed at democratising the process of preparing manifesto and that this ‘unique experiment’ will strengthen democracy. 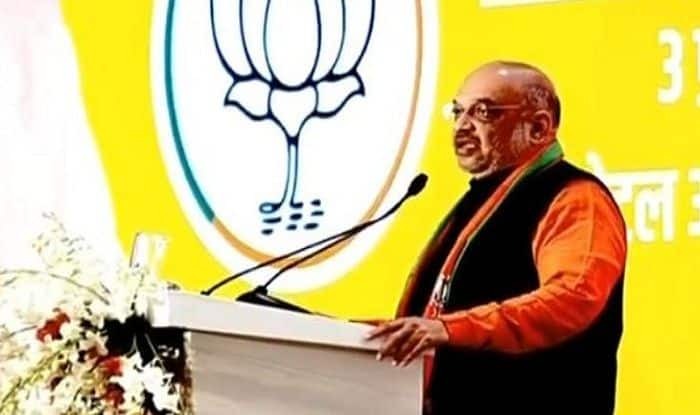 “What kind of country people want and what is their suggestion to achieve this; this exercise will reach out to them to seek their views,” Shah said and claimed that it will help the party realise the dream of a ‘New India’. “Over 300 vehicles will move across the country and over 7,700 boxes will be carried across 4000 assemblies to seek people’s views”, the BJP chief informed, adding social media and telephonic communication will also be used for the new campaign.